If you’re saying “Bah! Humbug!” to the ANUSA Elections this week, you might benefit from a visit from the Elections of ANUSA past. This compilation covers stories of ANUSA elections spanning the last 22 years, and includes highlights such as embezzlement, a ban on tickets containing the letter ‘i’, and 124 nominations for Treasurer in one year. We’ve omitted some years because they weren’t spicy enough. These past elections have shaped how elections are currently run, and some have been forever seared into the collective student memory. Disclaimer: Many of these events were not well documented, and so their descriptions have been pulled together from a number of sources of varying veracity. Stand Apart, a ticket associated with the ANU Liberal Club, removed a candidate less than three hours after they launched. The conflict occurred after an ANU Liberal Club executive allegedly offered $400 to the Men’s Network, in exchange for the candidate (then President of the Men’s Network) allowing the Liberal Club to make all the political decisions for the ticket. The only candidate elected from the ticket, Ashish Nagesh, is running this year as the head of the Reform Ticket. This year was the first to have online elections. Before 2016, voting was done via paper ballots and the ACT Electoral Commission monitored the process. In 2016, voting moved online to the Membership Solutions Limited (MSL) platform. However, elections had to be delayed just days before the scheduled start of voting due to issues with ANUSA’s negotiations with MSL. A large number of joke tickets ran in this year, including Make ANU Great Again for ANUSA 2017; Hustle Loyalty Respect (The John Cena Party); Shark Cage Diving – Lake Burley Griffin Four ANUSA; and 2B4 ANUSA: Objectively the Most Bestest Thing Ever, You Cannot Disagree. Candidates ran under names such as ‘Slippery Digby’ and ‘Prince Ali Sxc Persian Boi’. Lewis Pope, who ran on Make ANU Great Again for ANUSA 2017, was elected as a Gen Rep. He went on to become Clubs Council Chair in 2018. 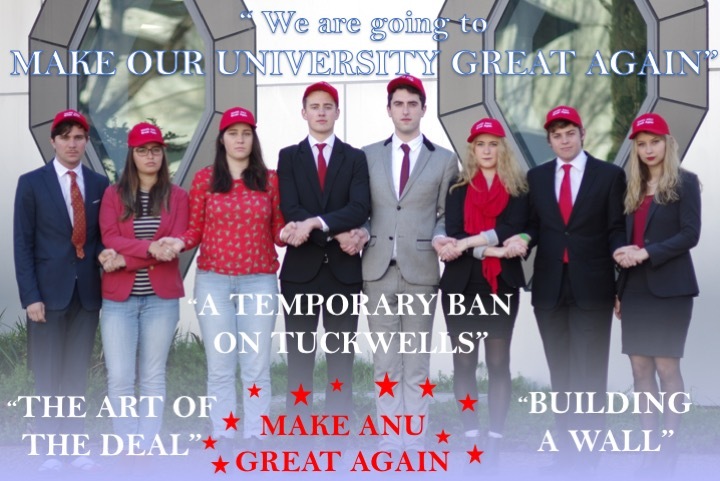 Make ANU Great Again had a General Representative elected. 2015 was the year of what would soon be dubbed “Ready-gate”. The ANU Labor Students’ Club (Labor Right) formed a coalition with Labor Left and ran four separate tickets, three of which had only General Representative candidates. This allowed the tickets to collectively have more funding, a larger pool of campaigners, and more Gen Reps to siphon votes to the executive. Not all members were from Labor, although the ticket was largely Labor-aligned. One of many memes about Ready-gate. The ‘ticket’ claimed to be independent, and its official campaign manager was Ben Kremer. However, it was alleged that the ticket was actually being run by Megan Lane, a former ANUSA General Secretary who at the time was a Labor staffer. Prior to the election, a second year Labor Left member, Eben Leifer, wrote an article for Woroni discussing the tickets and how they were formed, including the deals between the Labor factions to divide Ready’s Executive positions. Woroni did not publish the story, and instead a member of the Board allegedly notified Lane of the article. Lane allegedly contacted Leifer and other members of the Left faction, stating that if Leifer did not pull the article, “there will be no materials provided for left candidates, no preferences, no how to votes and all left candidates will be purged from the ticket”. Leifer posted the article, as well as screenshots of messages, to ANU Stalkerspace (now ANU Schmidtposting) on the Tuesday of election week. Most candidates distanced themselves from Ready in the wake of the controversy, instead running as independents. The 2012 ANUSA President, Fleur Hawes, resigned after being academically excluded. Woroni reported that she failed more than 50% of her courses in Semester 2 2012, as well as an earlier semester. She appealed the decision, but when her appeal was rejected mid-way through Semester 1 2012, she was excluded. This meant she was no longer a student and so could not hold a position in ANUSA. The vacancy was filled by the Treasurer, and the SRC elected a new Treasurer. This year also saw a highly contested election, with 117 candidates between six tickets. On a non-election-related note, it emerged in June 2012 that more than $125 000 had been embezzled from student groups, including $74 000 from ANUSA. This money was allegedly taken by someone who had, at the time, been ANUSA Treasurer. The elections were postponed after changes to the Constitution lead to term lengths being undefined, meaning representatives could potentially reign forever. For a number of years before 2007, a politically unaligned group maintained power by choosing and endorsing successors. Students tended to vote for this group over the alternative presented each year by Labor Right, in light of 1996’s ‘Wad-gate’ scandal – more on that later. However, in 2007, the unaligned group merged with Labor Right to create a single ticket, after the 2007 President refused to designate a successor. Members of the Labor Right were included in the executive for the first time in over a decade. 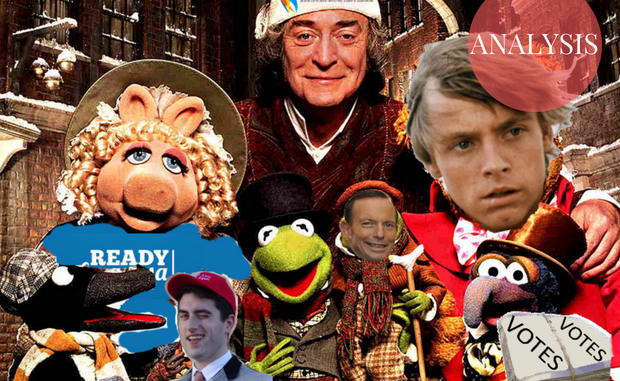 The education officer, James Higgins, resigned a week into office, after hijacking a talk by Tony Abbott in O Week. He described himself as the ‘socialist alternative education officer’ when talking to Triple J. The Environmental Department didn’t put forward a Collective-endorsed candidate, and as a result the position went to a joke ticket from ‘The Independence Party’ instead, who won against another joke ticket. Content Warning: This section contains references to terrorism and simulated death. The terrorist yeh kidnapping, complete with Disney masks and toy guns. Photo from the Woroni archives. The joke ticket ‘Terrorist Yeh’ allegedly had the AFP called on them, after their stunts were mistaken for a real terrorist attack. A mock hanging was reportedly performed from the ANUSA building balcony in Union Court, while a man dressed as a plane ran repeatedly into the Union Building. This incident occurred less than three years after the 9/11 terrorist attacks. A candidate from another ticket was apparently taken hostage by members of ‘Terrorist Yeh’, who were wearing Disney masks and holding toy guns. The ANUSA President election was decided by one vote, with the deciding ballot remaining questionable because it was filled out with ticks and crosses instead of numbering, but was counted anyway. Five people were given General Secretary ballots instead of President ballots. The Disputes Committee was headed by the other non-joke ticket candidate for President. However, the Disputes Committee ultimately ruled in favour of the originally elected candidate. A General Meeting passed a Constitutional ban on ticket names that contained the letter ‘i’. This was apparently due to students feeling that tickets calling themselves ‘independent’ were not in fact so – such tickets, based on the previously described succession model, had held power since 1999. ACT Elections only agreed to supervise the election under the condition that this ban was removed, due to the requirement that elections be “free and fair”. The ANU Challenge Club had over 124 members nominate for Treasurer after a dispute with ANUSA, under the ticket name of ‘The Luke Party’. The ticket ran on a Star Wars theme and had a slogan of ‘Vote 1 Yourself for Treasurer’. The Labor Right Ticket ‘Rage’ was reported to have placed 146 extra ballots in the ballot box, which were folded into “suspicious looking wads”. This was apparently witnessed by a student sitting in a nearby cafe, and the votes in the wads were excluded. Had the votes been included, the outcome of the election would not have changed. 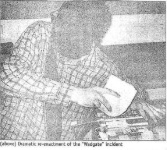 The event was later dubbed ‘Wadgate’ by students. Labor Right was not included in the Executive again until 2006. 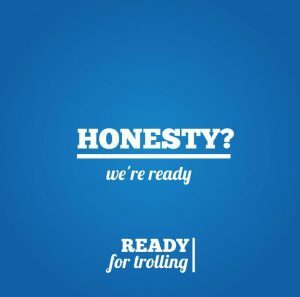 Following the scandal, the ACT Electoral Commission was asked to monitor student elections- a practice which continued until voting went online in 2016. Reenactment of Wad- Gate. Photo from the Woroni archives. Eliza Croft was a candidate on Make ANU Great Again in 2016.